World in Motion: A real life avatar. No pixels required. A real life avatar. No pixels required. Good morning! Ok so this has to be the CRAZIEST thing I have ever seen. Almost reminds me of the Ray Ban spot we highlighted a little while ago. Anyways, this type of promotion may have gone a little too far but hey if the guy wants to do it...whatever! 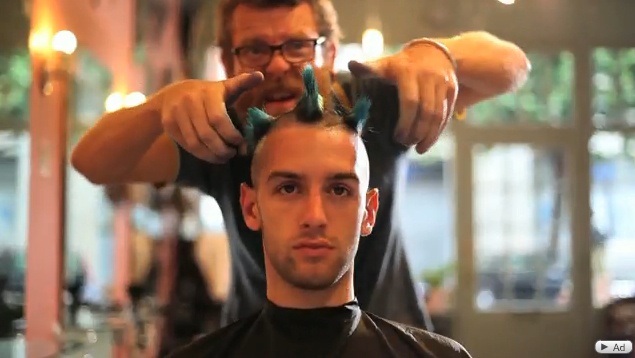 So, EA and Dare Digital have taken an actual person whose name is Josh and turned him into a real life avatar. They are hoping to promote an online multiplayer game called APB, All Points Bulletin. The Human Avatar campaign was inspired by the actual game's customization engine, and has asked fans of APB to select and then transform a real person in to a living breathing avatar. As of now, Josh has gone through three stages of the avatar transformation. Stage 1 was the haircut, stage 2 was the piercing, and stage 3 was the tattoo. I need to give this guy a lot of credit though for being able to go through all this. He must be getting a lot of money because I don't know why any normal person would decide to make themselves go through all this. Anyhow, you can find all three videos below! What do you guys think though? Is this type of promotional stunt a little too much? Can we really convince people to do whatever we want for the promotion of something so simple like a game? In the meantime check out the videos! Oh I forgot to mention, in stage 4 the fans get to select his wardrobe, I'll make sure to post that as soon as it becomes available. Thanks for the comment! The nose piercing was a little tough to watch, but I'm looking forward to how the next stage turned out. I'll make sure to keep you updated on future videos and whether or not the campaign was in fact successful.